To illustrate 3 of these points there is a lot we can learn from the online shoe store, Zappos. It is in the media for it’s holocratic (no job titles, no managers) culture of happiness and it’s amazing customer service but they are also incredibly successful at selling – turning over $1 billion a year. So whatever business you are in, their sales and marketing strategies are worth looking at. Zappos has shown equal transparency in delivering both good and bad news. In January 2012, the company’s accounts were hacked – making 24 million customers vulnerable. Rather than attempting to ignore this situation, Zappos openly admitted to the crisis and encouraged its customers to change their passwords. Likewise recently Kayne West (singer) accused Zappos publicly of selling sh*t product. 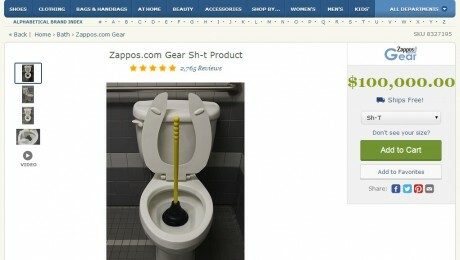 Rather than shying away from this – Zappos posted a toilet for sale on their website to join in with the publicity. Zappos understood that transparency, regardless of whether the news is good or bad, is the right way to do business to win and keep clients. Zappos does not sell discount or unique products. They have no competitive advantage when it comes to products yet they still make over $1B in sales. How? Their secret lies in customer service and word-of-mouth referrals from people who have been absolutely delighted by their purchasing experience. Zappos invests heavily in creating experiences for its customers in the buying and service process. This is responsible for their incredible word-of-mouth sales success with 75% of their sales coming from returning clients. Trust within your staff spreads to your clients and increases sales. That’s a good place to start. Zappos pride themselves on their communication. Call centre employees don’t have scripts, and there are no limit on call times. The longest call reported is 10 hours 29 minutes. If a customer calls for a product and Zappos does not have the product in stock, they recommend a competitor who has it. The CEO, Hsieh says that, while Zappos will lose the sale, in the long run it’s best for Zappos because the customer appreciates the help and tells their friends the story. It creates positive word of mouth publicity. The money they would have spent on advertising and marketing they invest in making the customer’s experience so amazing that they tell their friends and come back for more. Are there any lessons there for your business?